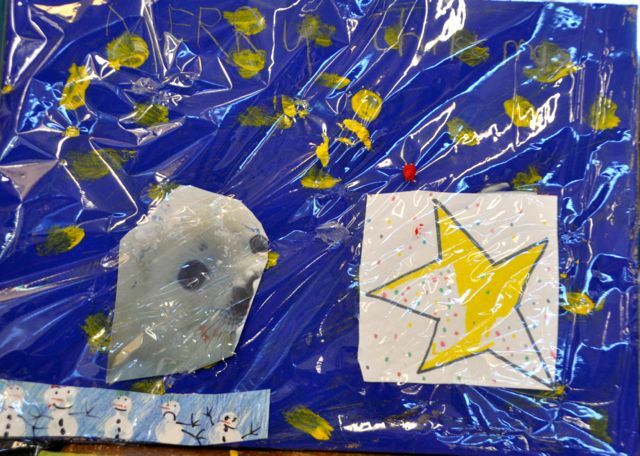 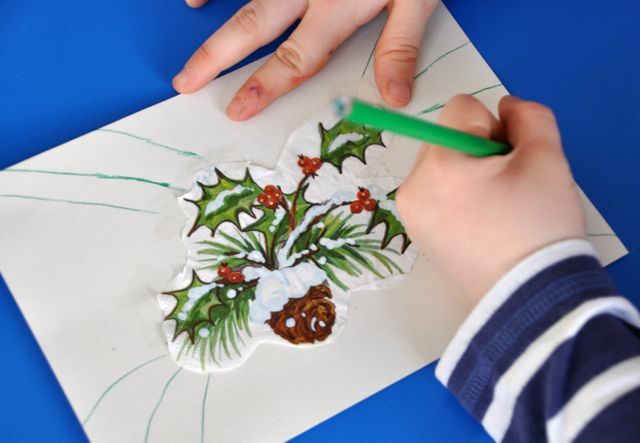 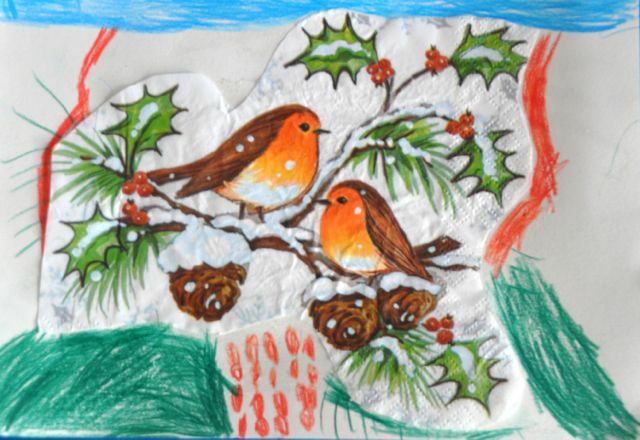 Day two of our Christmas Art Course led by artist Abigail Hunt continued to push children’s ideas about what could be done with paper. 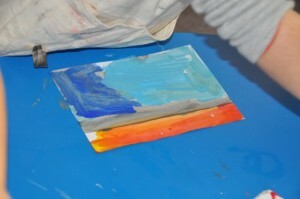 Click here for information about Day 1. Sabrina Smith-Noble began the day by encouraging children to warm up their minds and bodies. 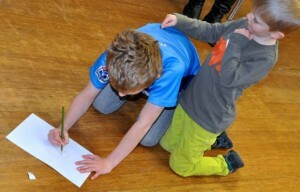 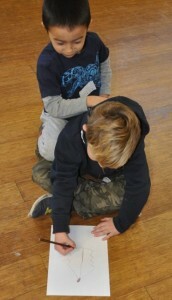 Children drew on each others back, then transferred the drawing onto paper, using their senses to interpret the marks on their back. 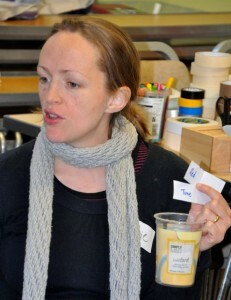 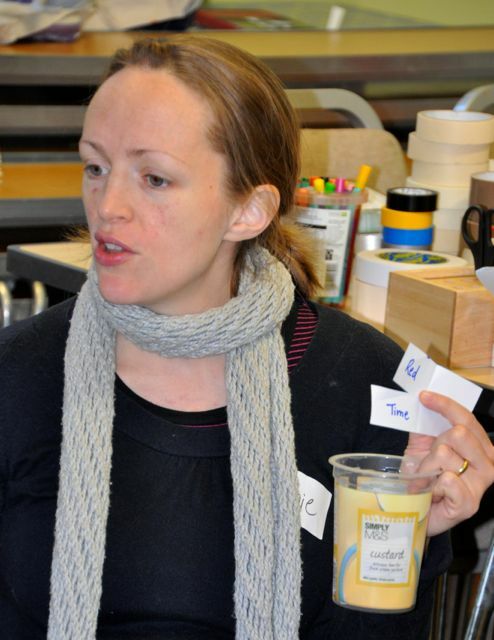 We then worked as a large group on an activity that stretched our lateral thinking and ability to make connections between random images. 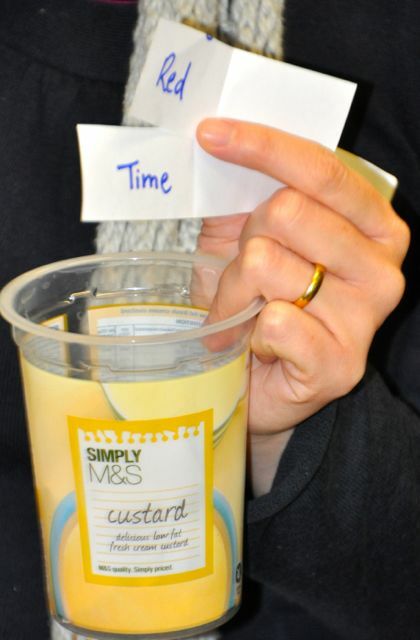 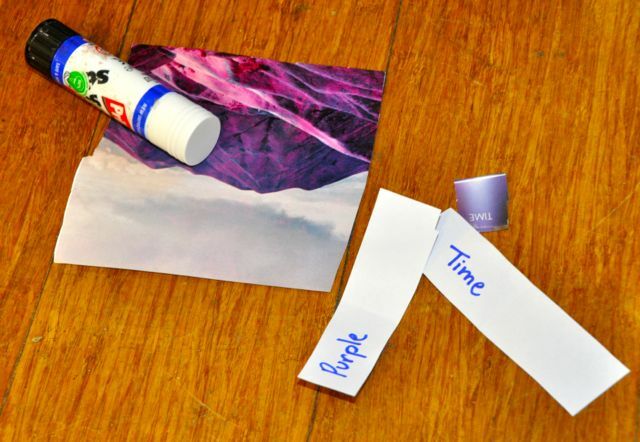 Abigail gave children a stack of images and a choice of 2 words. The challenge was to find 6 images that could be connected by these words. 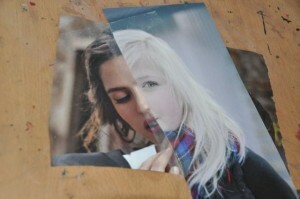 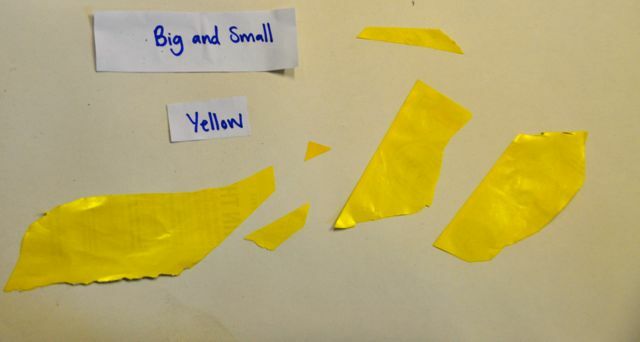 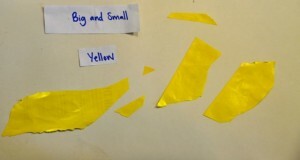 The 6 images were arranged on a large strip of paper for all to see. 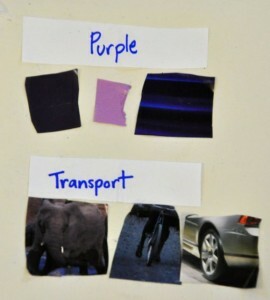 It was interesting to see how the children’s brains worked in different ways to interpret the task. 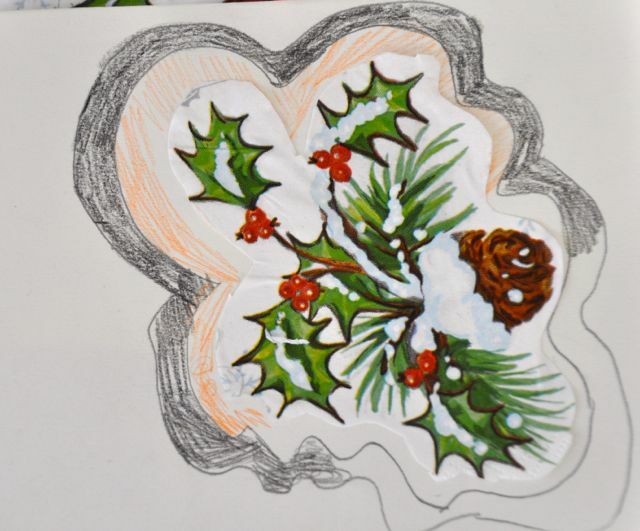 We then split into 2 groups to work on a Christmas inspired activity, using old Christmas cards to make a more substantial piece of work. 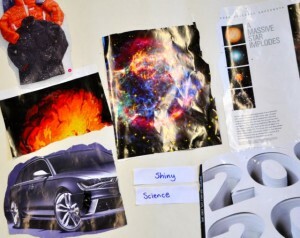 Some more warm up activities got us thinking about how to use found images to make new work, and interesting connections. 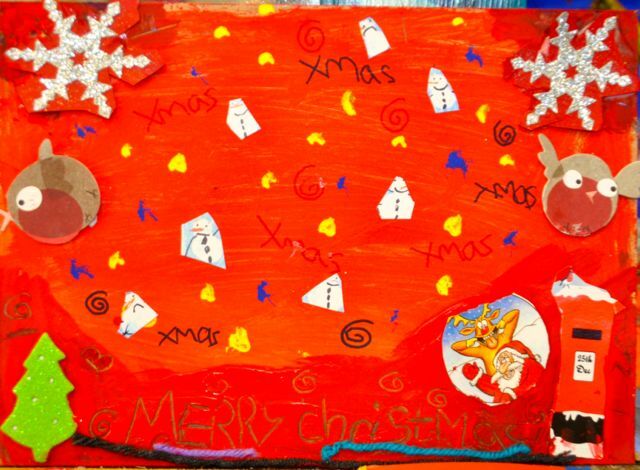 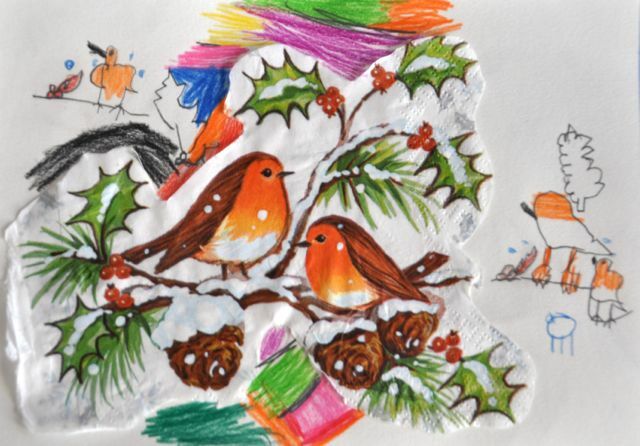 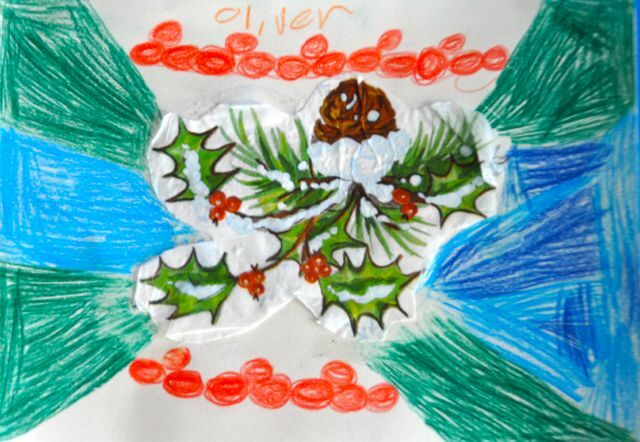 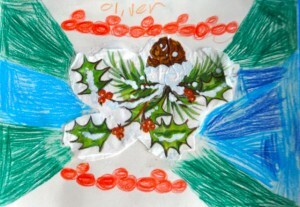 The younger children used old christmas napkins and interpreted colours and shapes to extend the picture into something new. 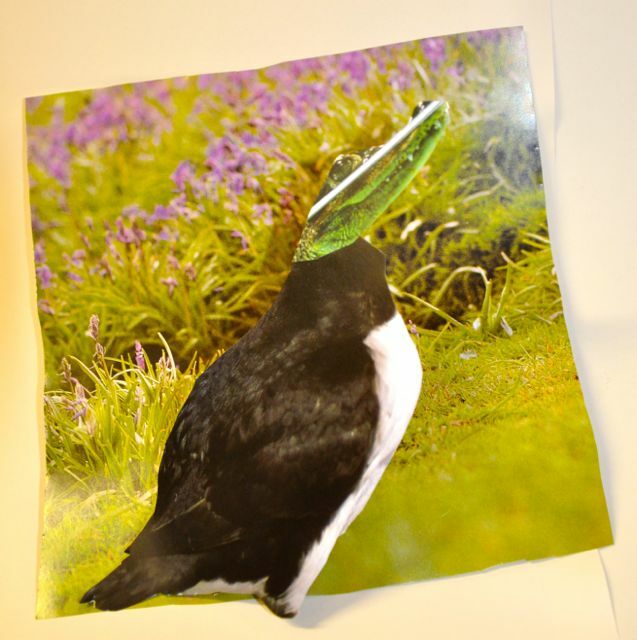 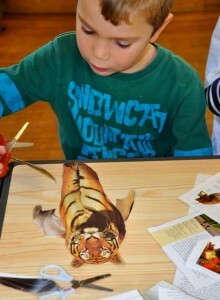 Older children continued to look at magazines making new images from 2 others. 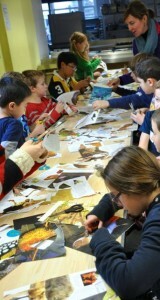 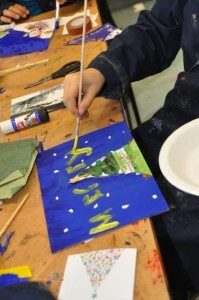 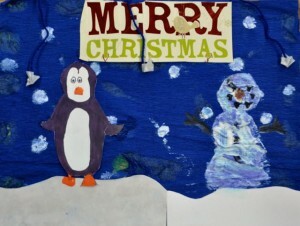 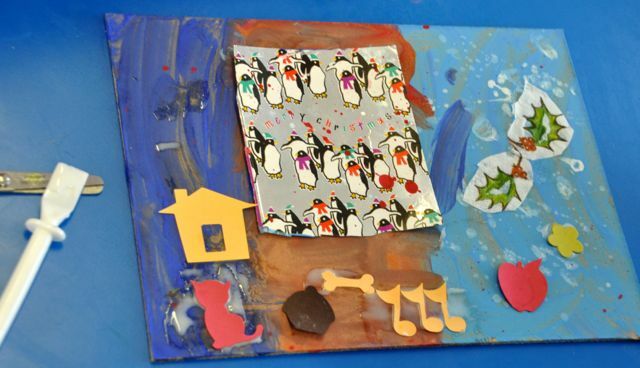 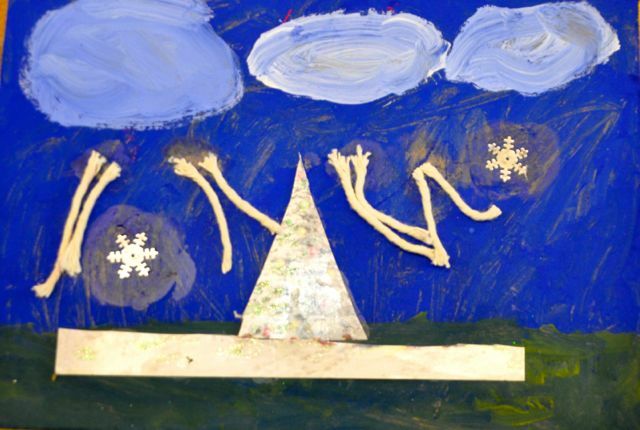 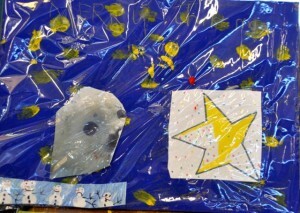 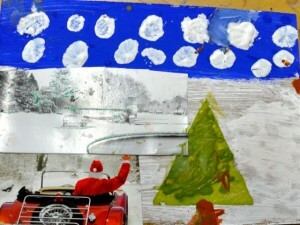 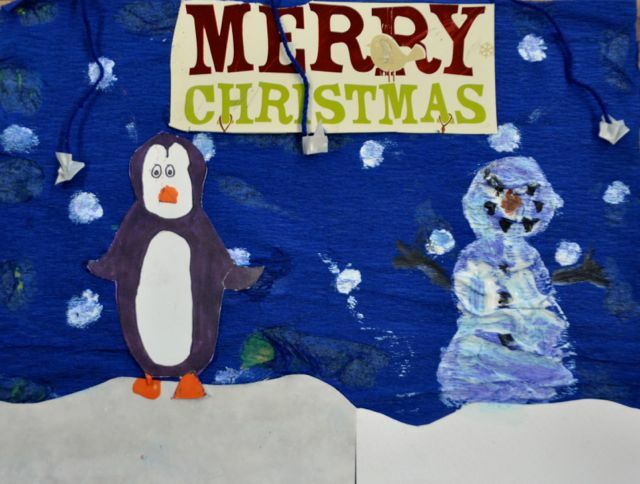 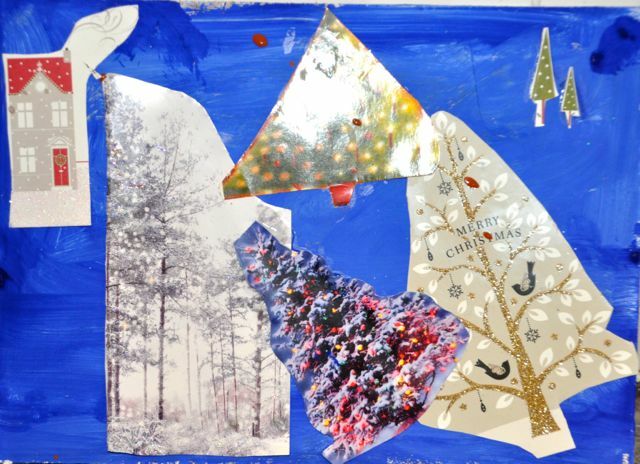 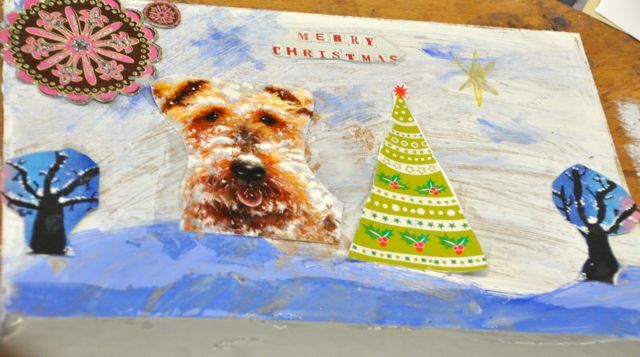 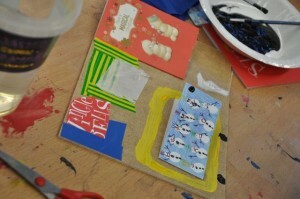 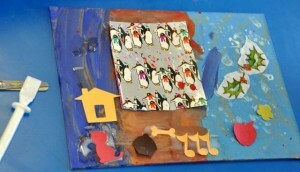 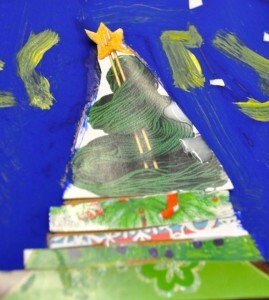 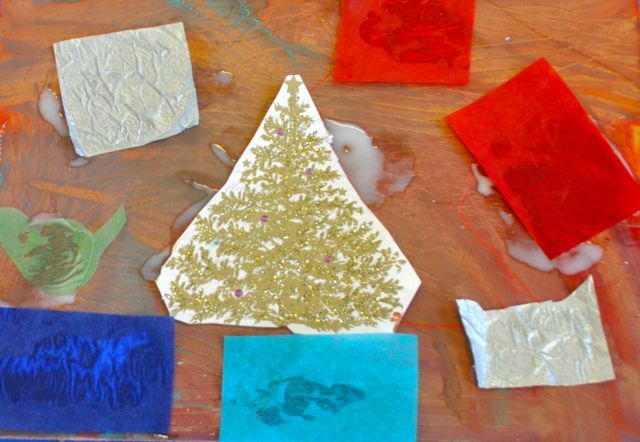 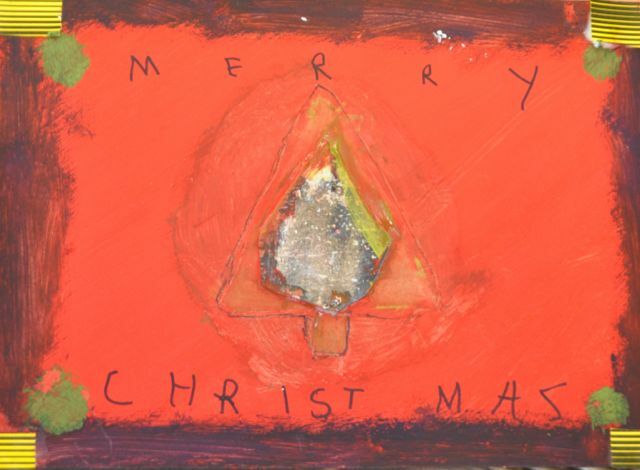 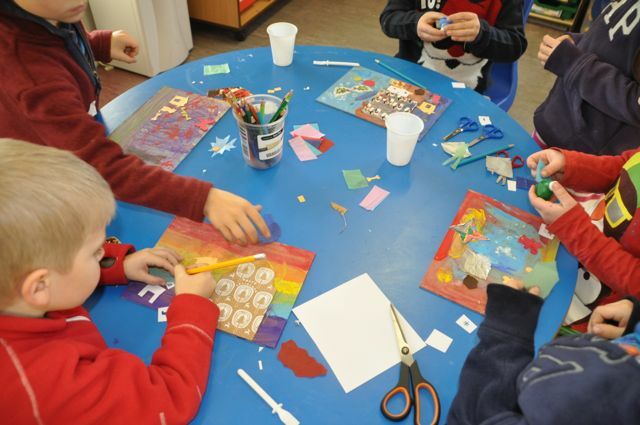 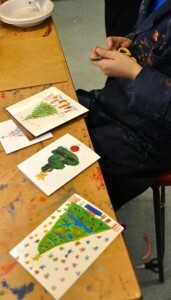 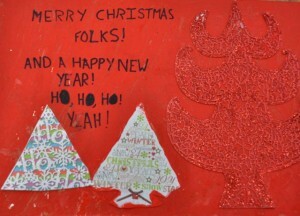 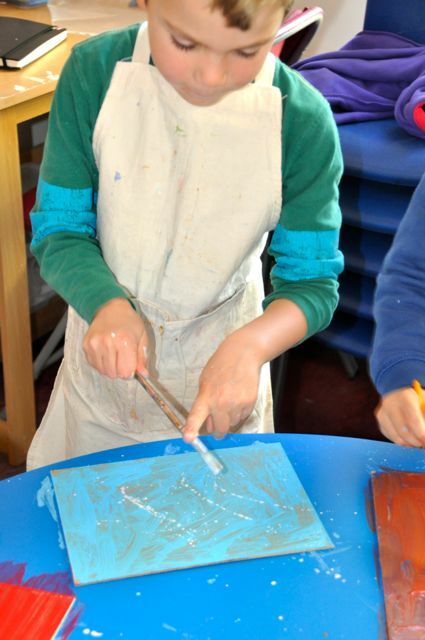 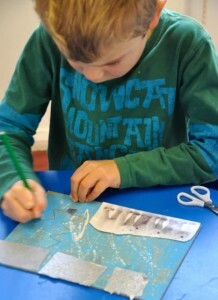 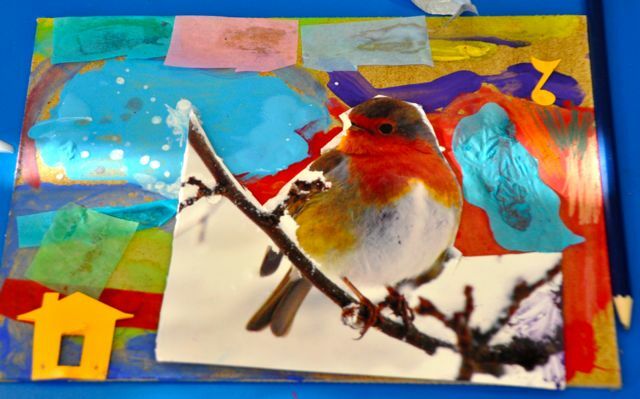 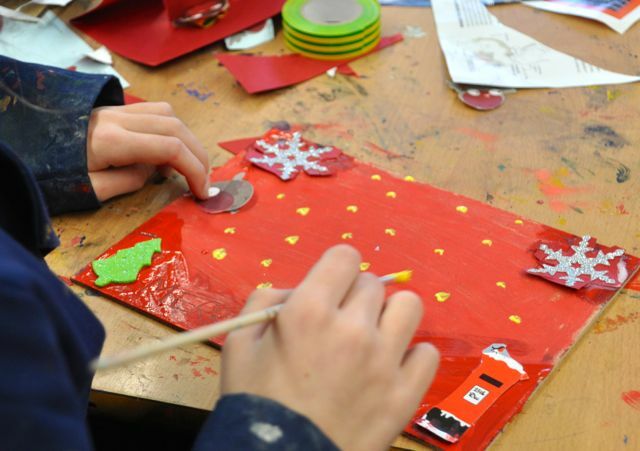 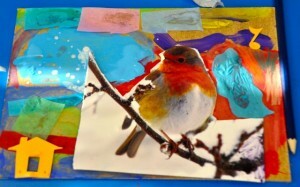 Both groups worked onto a wooden board to layer found images from Christmas cards with paint and collage material. 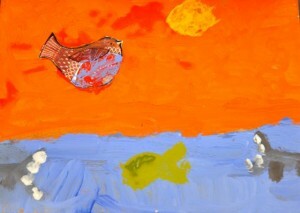 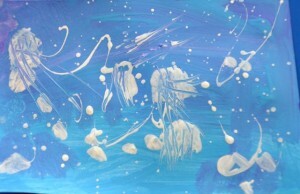 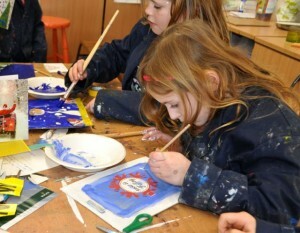 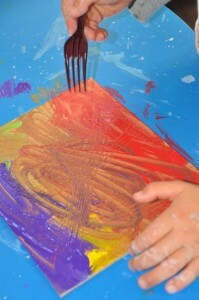 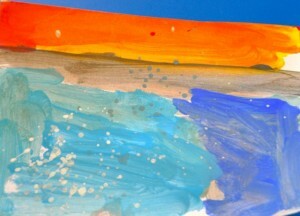 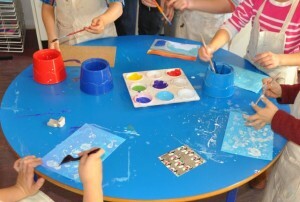 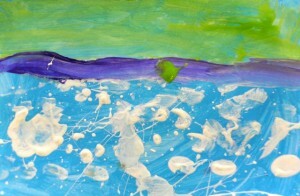 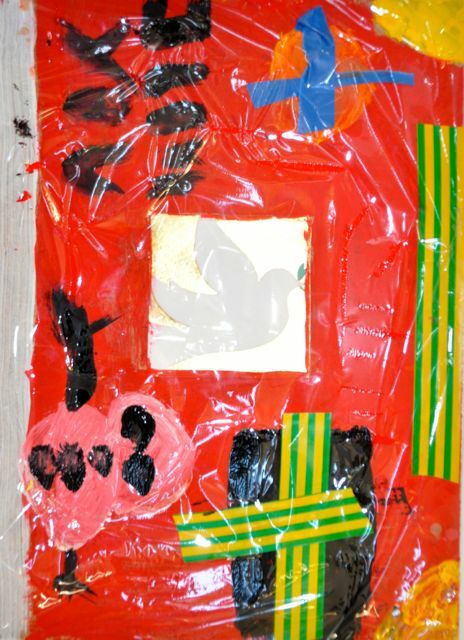 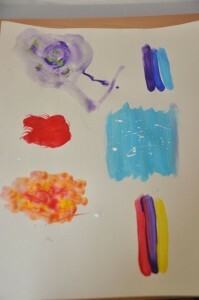 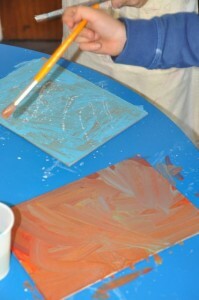 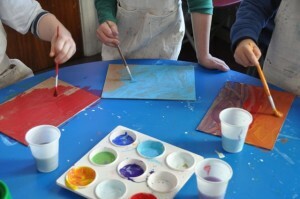 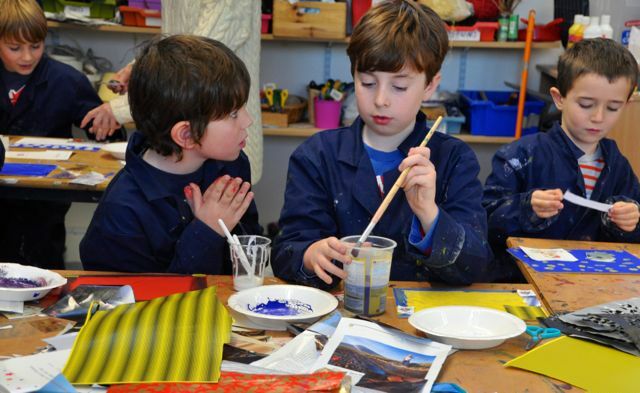 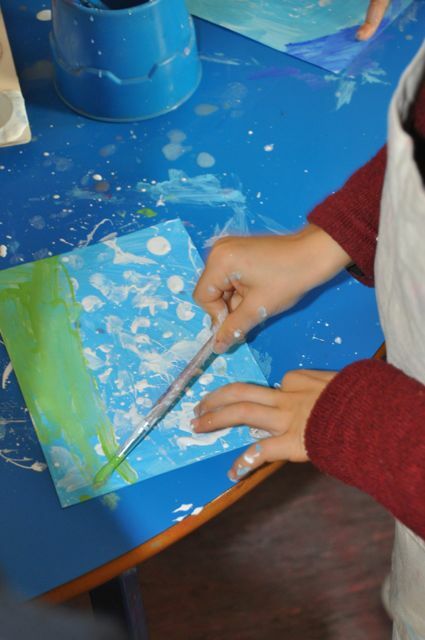 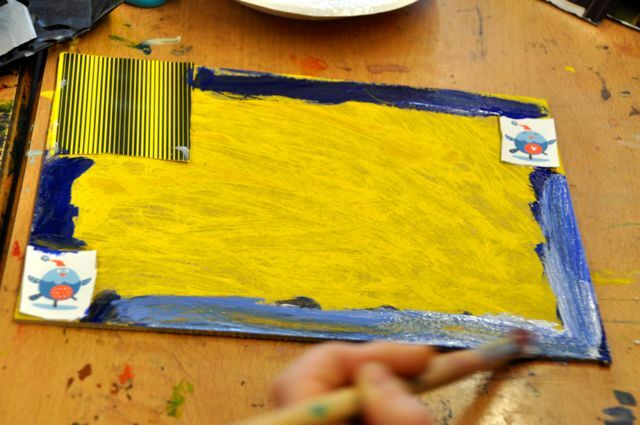 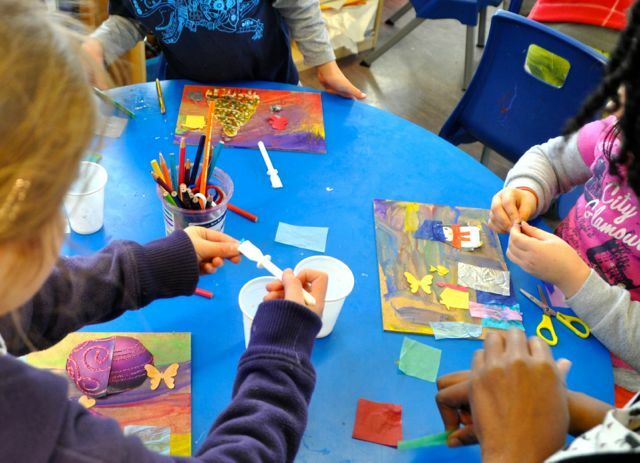 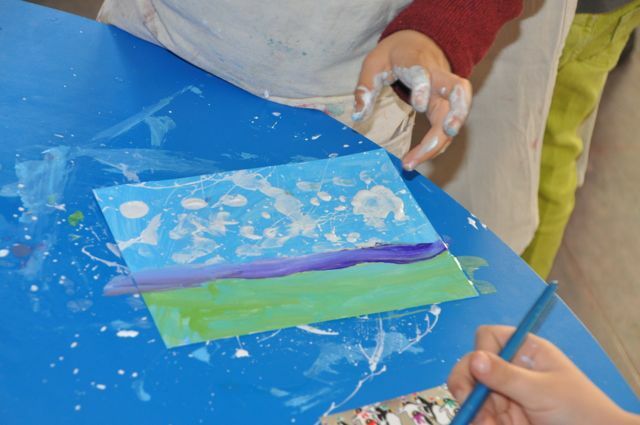 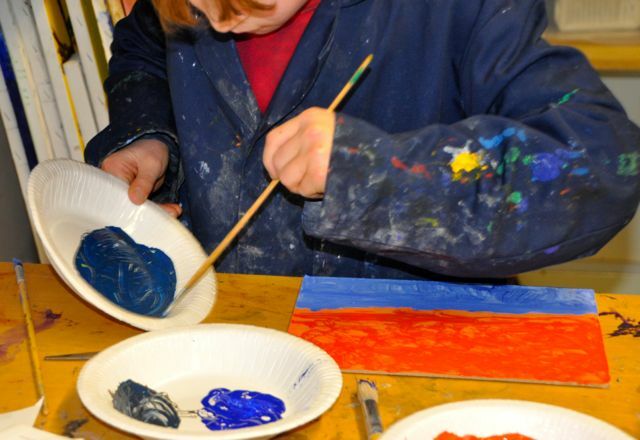 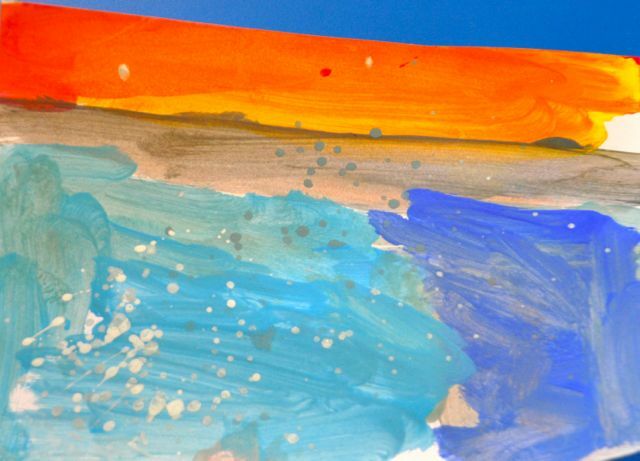 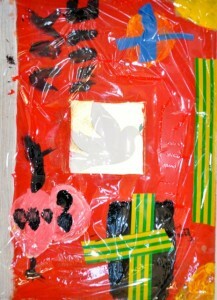 Younger children experimented with paint techniques to create a background. 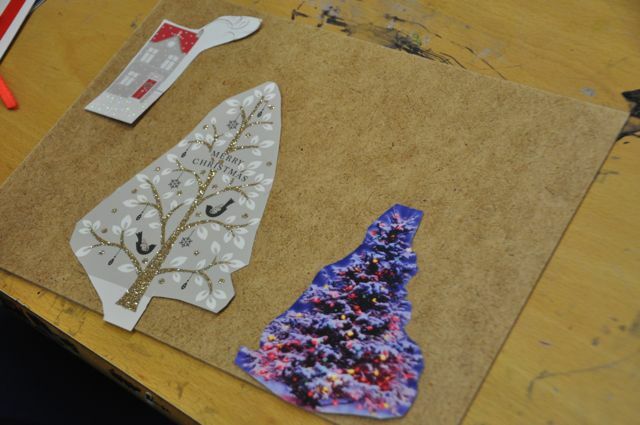 Transferred ideas onto a board. 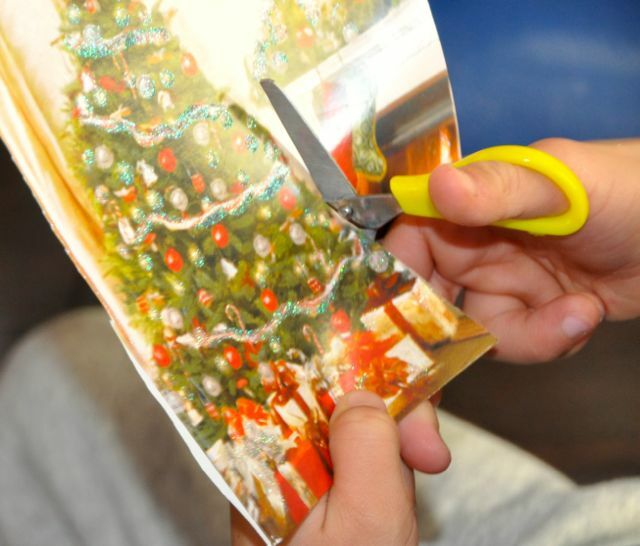 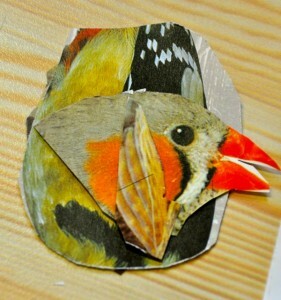 Then layered cut up christmas cards and other materials. 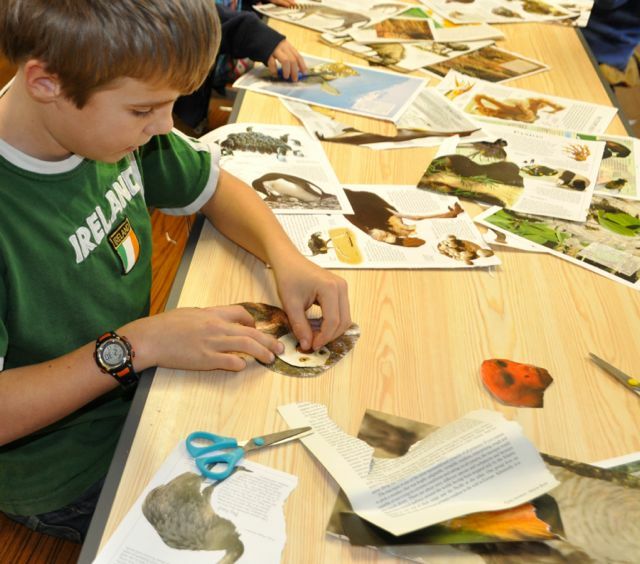 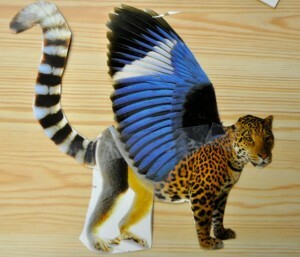 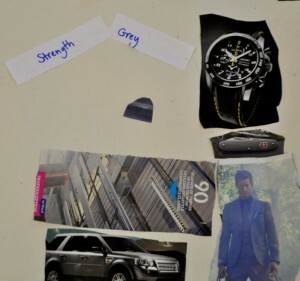 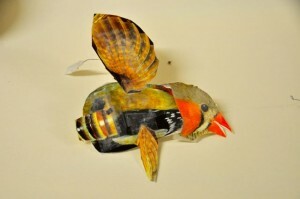 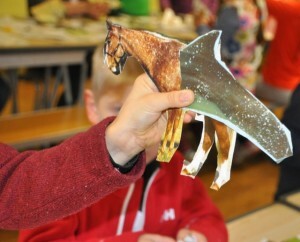 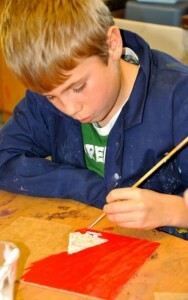 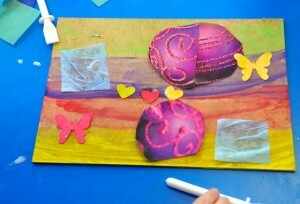 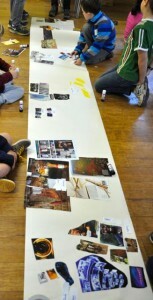 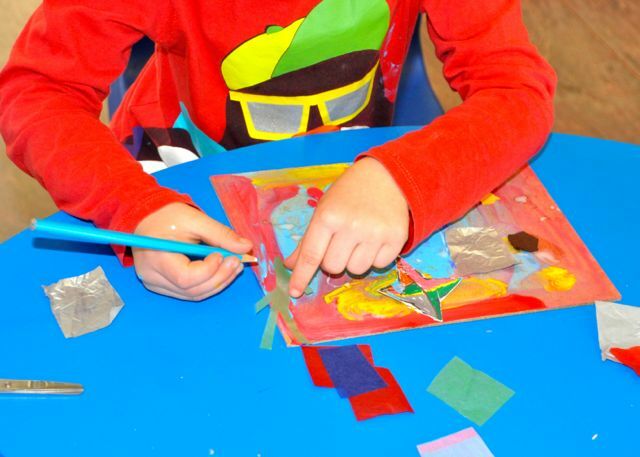 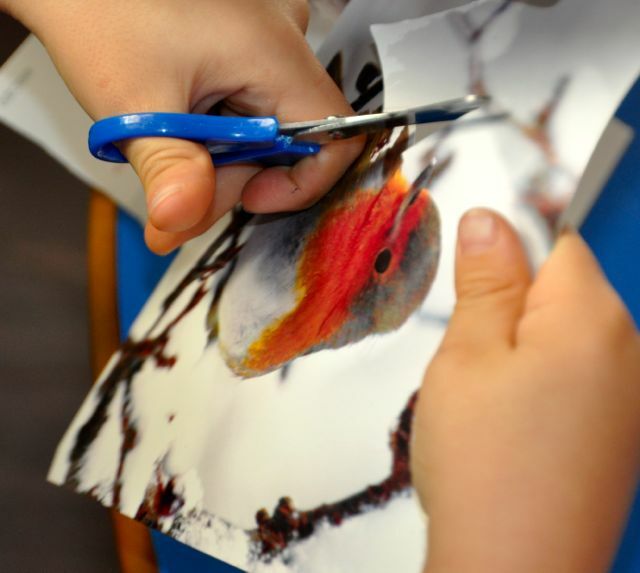 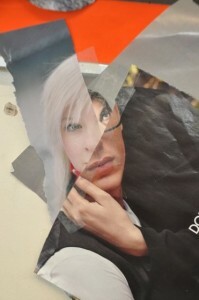 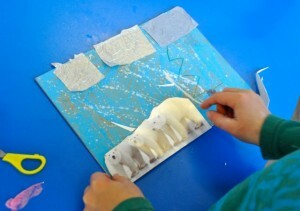 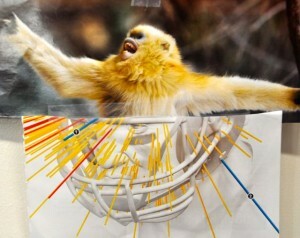 The older group worked with a similar technique, often working systematically and purposefully to sort and layer images into their final work. You may find one of these in your Christmas stocking this year! 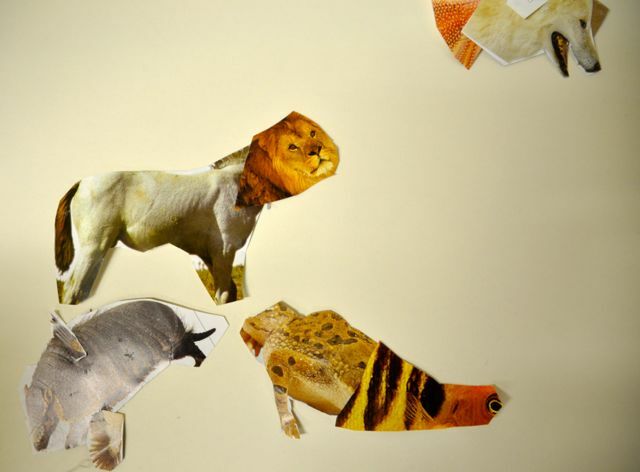 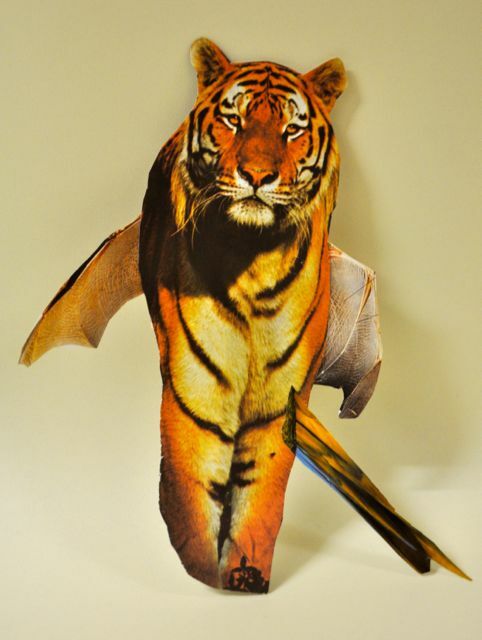 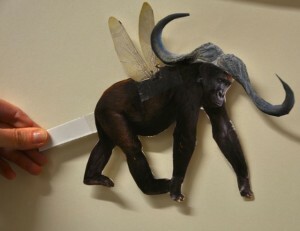 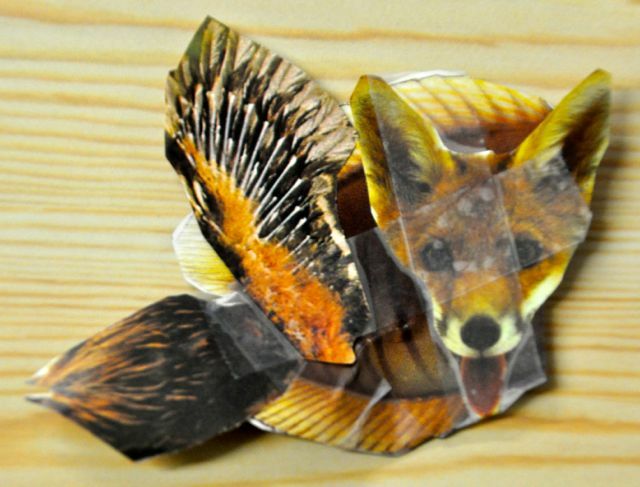 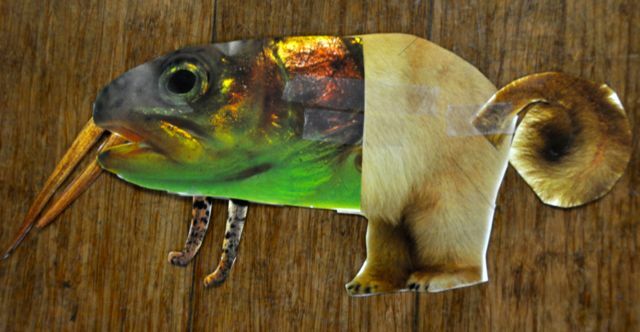 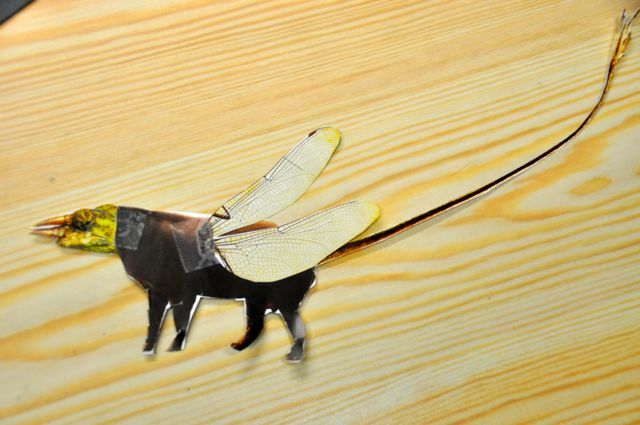 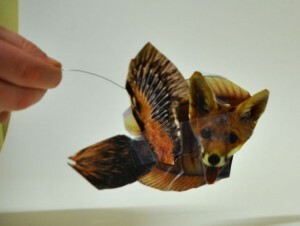 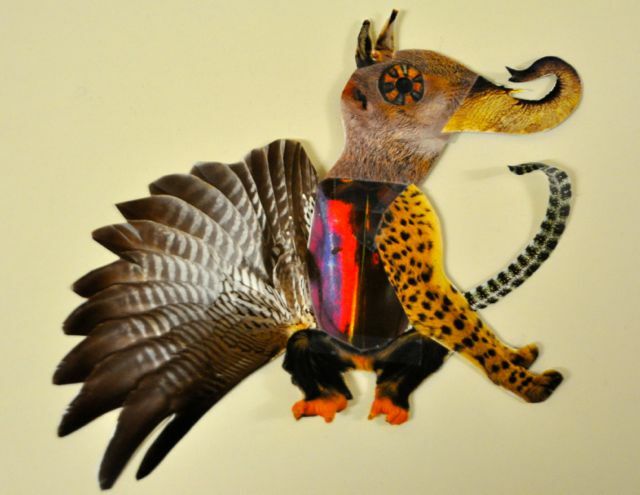 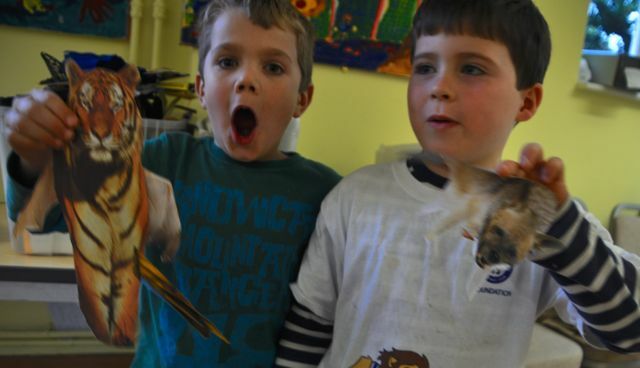 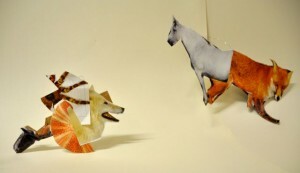 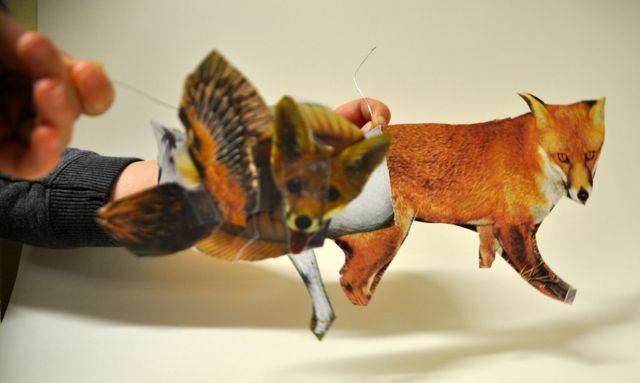 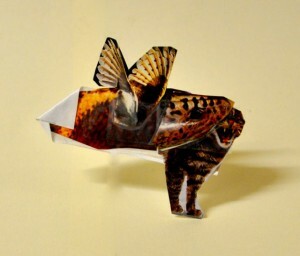 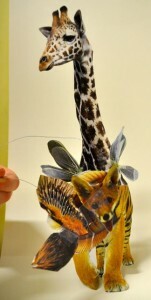 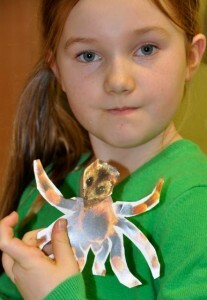 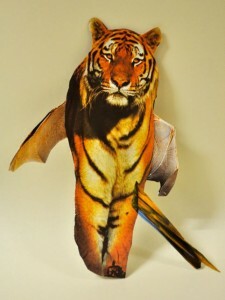 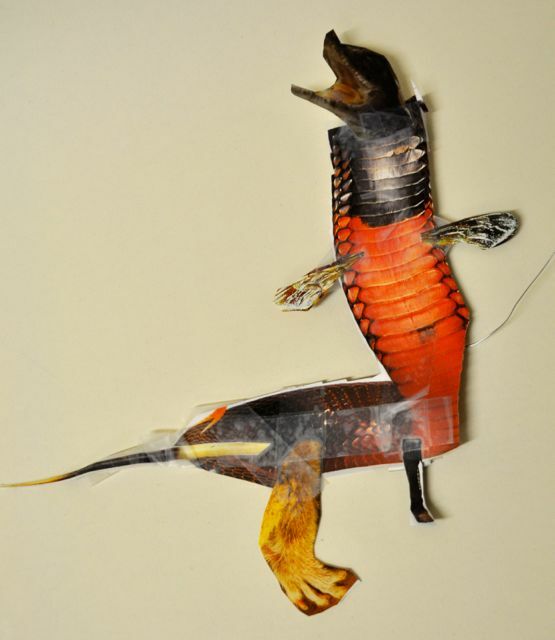 In a final splurge of creative chaos we worked together once more to make tiny puppets, morphed from pictures of creatures cut from animal encyclopedias and magazines. We made crazy combinations and worked hard on our cutting skills to join pieces carefully and accurately. 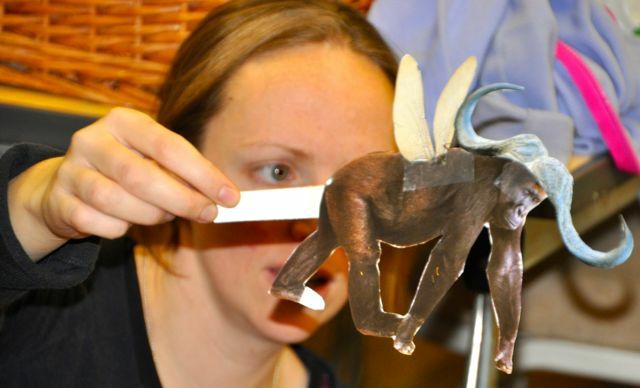 We used double sided tape, cardboard strips and thin wire to make them into little puppets that could be move about and placed into scenes. Some of us started to create stories…but maybe you could continue this at home….